Corporate e-mail addresses are estimated to increase by 25% to 4.3 billion addresses by 2016. The drive to connect business to businesses and businesses to consumers has never been greater. But as companies expand their communications options and offer customers electronic means for corporate and in-store contact, oversight becomes more and more of concern. Will an associate properly and effectively support the brand? Will an associate follow corporate protocol when communicating with a customer? Can pricing and information accurately be conveyed to the customer? And can all of the information be conveyed through an intuitively easy to use tool, which has strong oversight? The last question might best be answered first. With the Communicate&Convert tool, all e-mail between associates and customers is fully tracked. Store managers, or dedicated corporate administrators, have full access to all outbound and inbound e-mail correspondence. Whenever an associate presses the send button in an e-mail that they write from inside the store or outside of the store, the first stop for that e-mail is an administration screen where the e-mail can be reviewed before it is released to the recipient. Because the e-mail conversation is threaded, all elements of the e-mail are visible to the administrators. This is important for several reasons. The first is simply to recognize that while the associates might begin e-mail themselves, or from a pre-written template, all correspondence is saved and can be reviewed. Second, no e-mails will get lost or delayed because an associate is out of the store. E-mail can easily be responded to by the manager or administrator, or routed for reply by another associate. In fact, one of the most effective uses of Communicate&Convert is to train employees to send an e-mail template after each phone inquiry or in-person contact. The e-mail is added to the house-list, a personal relationship with the customer is being formed, and the details of contact are logged. Furthermore, managers and administrators have a 360-degree view of e-mails, which have not yet been replied to by associates. The review process is critical because not only must the e-mail be a seamless extension of the corporate brand image, but also the e-mail can include product and pricing information. An e-mail becomes more than simply another conduit for product information, or even an endorsement from an individual associate. 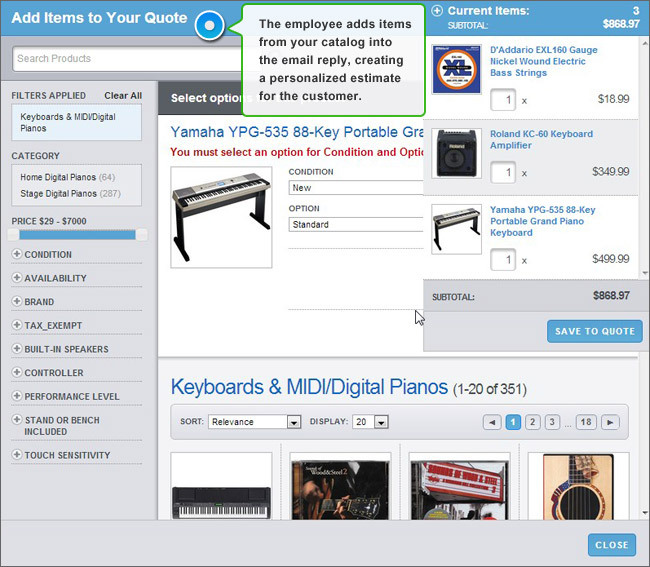 The e-mail becomes a personalized selling tool, which includes a product quote and optional pricing discount based on pre-set parameters. 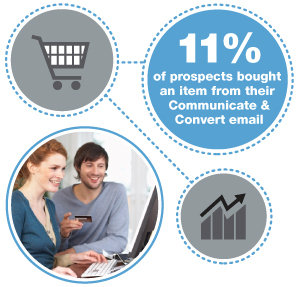 One large retailer using the Communicate & Convert tool recognized its benefit and converted 11% of prospects into buying customers, resulting in $717,000 per month in additional revenue! Many websites offer a “Contact Us” button with a generic e-mail address. But generic e-mails don’t do anything to personalize, or localize, the customer experience. Communicate&Convert lets companies connect knowledgeable, trusted employees with prospective customers while maintaining full supervision of all communication. If your goal is to connect retail locations with customers to increase in-store and on-line sales, Communicate&Convert has the robust functionality to complete that connection.